Much has been written about mindfulness in recent decades, but clinicians are often left without concrete, practical skills to teach clients in acute distress. Applying the methods of an evidence-based intervention such as Mindfulness-Based Cognitive Therapy (MBCT), requires in-depth knowledge and personal experience. MBCT is an 8-session program first developed by Zindel Segal, Mark Williams, and John Teasdale, and has been shown to cut relapse rates for depression in half. It has been shown to be helpful for such issues as stress, anxiety, depression, chronic pain, and PTSD, and is also beneficial for clinicians themselves. Join mindfulness expert Dr. Richard Sears, author of Building Competence in MBCT, as he personally guides you through all of the techniques and principles of MBCT through lecture, discussion, and experiential exercises. This in-depth experiential workshop will foster skills and concepts that you can immediately apply in all of your clinical work. 1. Compile the underlying mechanisms that make mindfulness techniques effective for stress, depression, anxiety, trauma, pain, and addiction. 2. Breakdown the role of thoughts in perpetuating symptoms of stress, anxiety, and depression as it relates to ruminating thoughts and behaviours in clients. 3. Describe the brain changes associated with mindfulness practice to explain to clients the scientific effectiveness of practicing mindfulness. 4. Connect how mindfulness builds upon and refines the evidence-based principles of Cognitive-Behavioural Therapy (CBT). 5. Incorporate mindfulness practices into traditional CBT thought records to help alleviate clients of intrusive, obsessive compulsive thoughts. 6. Utilize specific mindfulness-based techniques to help clients disengage from the narrative of negative thoughts and emotions. 7. Organize the eight session structure used MBCT program in your own clinical setting. 8. Differentiate between the group process in MBCT vs. CBT to avoid clients’ cycles of struggling with distressing thoughts and feelings. 9. Practice guiding a client through a 3-minute mindfulness exercise to improve the consistency of conscious choices rather than automatic reactions when distressed. 10. Explore the use of decentering skills with a client, in a session, in the reduction of worry and ruminations. 11. Apply the three steps of the mindful inquiry process, after the mindfulness exercise is over, to help clients more quickly internalize the skills and attitudes that allows them let go of struggle and make conscious choices. 12. Adapt the MBCT curriculum to different client populations, including children, as it relates to treatment considerations. 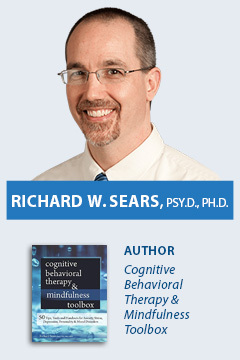 Richards W. Sears, Psy.D., Ph.D., ABPP is a board certified clinical psychologist in Cincinnati, Ohio, where he runs a private practice and conducts regular MBCT groups for medical centres as well as for the community. He is director of the Centre for Clinical Mindfulness & Meditation, and has several academic faculty appointments, including the UC College of Medicine Department of Psychiatry and Clinical Neuroscience. He was clinical lead on one of the first trials using MBCT for PTSD within the VA system, and is also on the first research team to conduct brain scans on children and adolescents before and after mindfulness practice. Dr. Sears is author of 10 books, including Building Competence in MBCT, MBCT for PTSD, and Cognitive-Behavioural Therapy and Mindfulness. He is an authorized Zen teacher, has a fifth degree black belt in To Shin Do/Ninjutsu, and once served as a personal protection agent for the Dalai Lama. Clinical Professionals: All mental health professionals including, but not limited to Clinical Counsellors, Psychologists, Psychotherapists, Social Workers, Nurses, Occupational Therapists, Hospice and Palliative Care Workers, Youth Workers, Mental Health Workers, Addiction Specialists, Marital & Family Therapists, Speech Language Pathologists, Vocational Rehabilitation Consultants and all professionals looking to enhance their therapeutic skills. Rates are based on single or double occupancy. A $15.00 charge will apply for each extra adult. Maximum occupancy is 4 persons per room. To receive the early bird rate, registration and payment must be received by Tuesday, May 21, 2019.